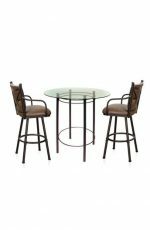 A pub or a “high top” table gives you higher seating when accompanied with bar stools. You may want higher seating in a billiard room so everyone can watch the game. And, if you have a restaurant, a bar or a pub, it helps guests see the TVs. Pub tables are also making their way into kitchens and dining rooms because of how versatile they are. They add dimension in the room and many of them can be narrower, which is perfect for small kitchens. 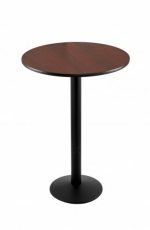 These pub tables stand 42 inches or 36 inches high and come with standard tabletop diameters of 36 inches, 42 inches and 48 inches. Pub tables work well next to a large kitchen window to give a lovely view of the outdoors. They can also be placed under a light fixture in the center of the room or even used as the main dining table. They’re often placed in the corner of a room because they take up minimal space and create an uncluttered look. When paired with glass tabletops, they create an open, airy feel. In larger kitchens, they give balance and depth when paired with a 36 inch high island or counter. 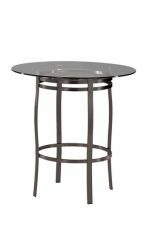 The pub table offsets the lower height counter to create a multi-dimensional look. Outside of the kitchen, many people love pub tables because you sit high and have a better view. They’re great around the pool table so people can watch the game. They also work well in rec rooms or on swimming pool patios, especially if you want to keep an eye on children. 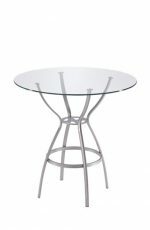 Pub height tables also work well next to tall living room windows for relaxing with a cup of coffee or a glass of wine. Please note: A 42 inch tall pub table should be paired with stools that have a 30 inch seat. 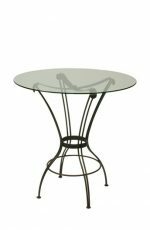 Clear glass is a common choice for the top of a pub table because it reveals the beauty of the table’s base. Many people ask us this question and honestly, the answer depends on which type of bar stool you find most comfortable. It’s harder to get into a bar height stool of 30 inch than a counter height stool of 26 inch, especially if you have a shorter build. A bar stool is more of a “climb”, while a counter stool is at hip level, where it’s easy to slide in and out of the seat. Many senior citizens and people with knee and hip difficulties can slide right into a counter stool. 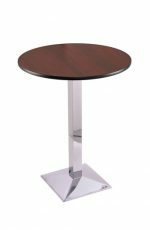 They often even prefer counter height tables and stools versus regular dining height tables and chairs. With a table height chairs, they find they have to bend too low to get in or out of the seat. You can order just the table base, if you prefer. We offer pub tables with or without the tabletop. You might have a top already or you might want to purchase it independently. Maybe you want to make your own! Either way — we can do that. 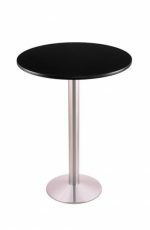 If you’re planning to use a granite or wood top, we recommend table bases by our brands: Callee and Trica. These bases are steel—strong enough to hold granite or heavy wood. If you have a wooden tabletop that you want to use, just let us know. We’ll add welded brackets to your base so you can screw the top down. Granite tabletops, on the other hand, are heavy enough that they don’t need to be permanently attached. 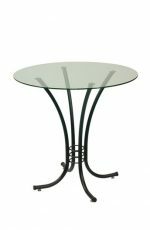 All of our glass tabletops are tempered, which means they won’t shatter if something is dropped on top of them. However, this glass can still chip or scratch like a car windshield. Most of our glass tops have a 1 inch bevel around the edge and are 1/2 inch thick, which gives the glass a lot of strength. 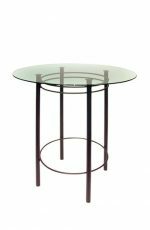 All glass tabletops are secured to the bases with heavy duty rubber suction. Plan for the width of the base. Some pub tables have bases that are wide where they meet the floor. This means you can’t push the stools very far under the table, so a wide base is best for rooms with a lot of space. For tighter areas, choose a table with a sleek pedestal base so you can push the stools in farther. Keep in mind that the diameter of the tabletop also affects how much room the table and chairs take up. 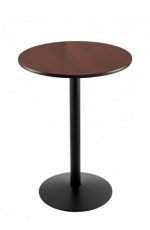 For a table with a 36 inch diameter round top, two or three stools fit comfortably. For a stool with a 42 inch tabletop, four stools is a nice fit. 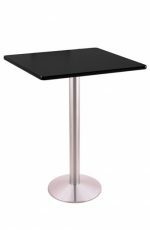 With a 48 inch tabletop, you can fit five or six stools, depending on their size. 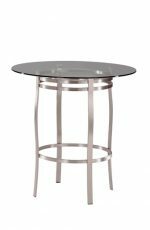 Most of our table bases, glass sizes, and stools are interchangeable, so feel free to create your own styles. If you want to customize beyond what we offer, just email or call us. We’ll do everything we can to help you!